Visitor profiling is the process of getting to know visitors and assign one or multiple target groups based on their behaviour. The result of the ongoing profiling process is a set of target groups, that are assigned with a certain assignment relevance to the current visitor. Pimcore provides two ways for profiling visitors based on their behavior. It is possible to associate Pimcore documents directly with target groups. This can be configured in Settings tab of each document as soon as there are target groups defined in in the system. Once one or more target groups are associated with a document, the selected target groups are assigned to the visitor and the assignment count is increased by one, each time this document opened by the user. Global Targeting Rules define a rule set based on which visitors can be profiled. Multiple conditions can be combined to complex criteria for assigning target groups to the current visitor based on their behavior. When assigning a target group via global targeting rules, also a assignment weight can be specified. This increases the assignment count of the target group respectively. 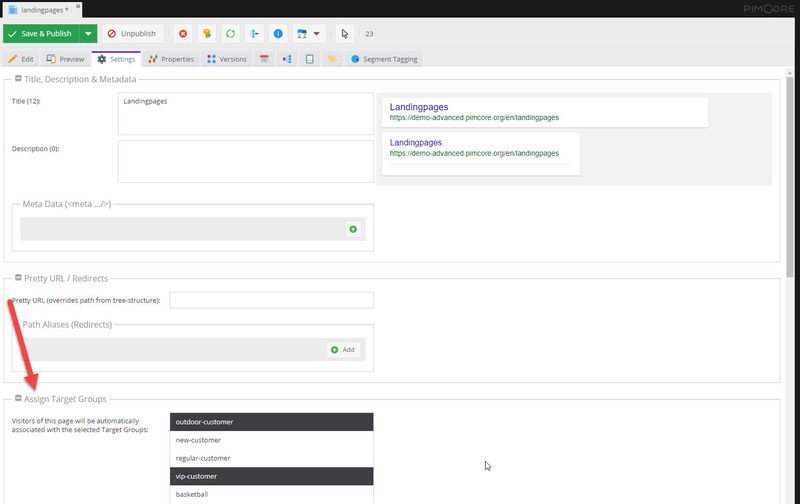 For more fine-grained profiling possibilities see our Customer Management Framework with its Customer Segment functionality and its extensions to the Pimcore targeting engine.